The born-again INT at La Palma, differs significantly in its mechanics, electronics and optics from the earlier incarnation at Herstmonceux: The change in latitude from 50 degrees 51 minutes 58 seconds to 28 degrees 45 minutes 43.4 seconds resulted in a large change of angle to the polar disc which stands almost on edge. A segment was removed from the disc in order to allow operation to a declination of -30 degrees. New encoders and drive electronics were fitted and a new computer control system was written. The primary mirror was replaced with a slightly larger one (from 98 inches to 100 inches) of considerably higher optical quality made of low-expansion material. The old prime-focus assembly, which required a caged observer, was replaced with one operated entirely by remote control; similarly, the Acquisition and Guidance Box at the Cassegrain focus is completely new. The telescope is housed in a new dome, the old one being left as a landmark for channel shipping. Finally, there is a suite of new instruments and a computer system to control them. The mechanical structure of the INT was shipped to La Palma in 1981 and was re-erected into the bare frame of its building in 1982. The mirror arrived on the island on December 10, 1982; the building was handed over by the contractors to the RGO on January 17, 1983 and work began on preparing the laboratories and workshops for the commissioning of the telescope. The first of three direct air shipments of machinery, instruments and computers arrived on La Palma on January 25. By September the building was in full operation and the telescope was fully assembled, with a freshly aluminised mirror, by the end of the year. On the first night of February 1984 stars were first seen in the telescope, at the prime focus. 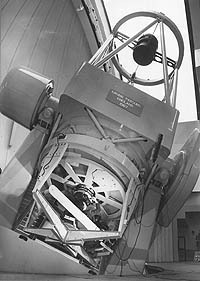 The telescope commissioning programme had been targeted towards the completion of the Cassegrain spectrograph since this would be the most widely demanded instrument; it was also tolerant to telescope pointing and tracking. In the spring of 1984 there was a concentrated effort to commission the Cassegrain instrumentation, including acquisition TV cameras, Intermediate Dispersion Spectrograph (IDS), IPCS and CCD detectors and ADAM, the software environment which brings together this complex of instruments into one working station. This programme was completed in May. On May 29 1984, the telescope welcomed its first scheduled astronomer. It operated for astronomers for 47% of the time in the first six-month period (Semester F), 50% in semester G, 62% in Semester H and 73% in Semester I. The rest of the time was used for engineering work. The optical telescope assembly weighs 51,361 kg and including the mounting 85,361 kg. 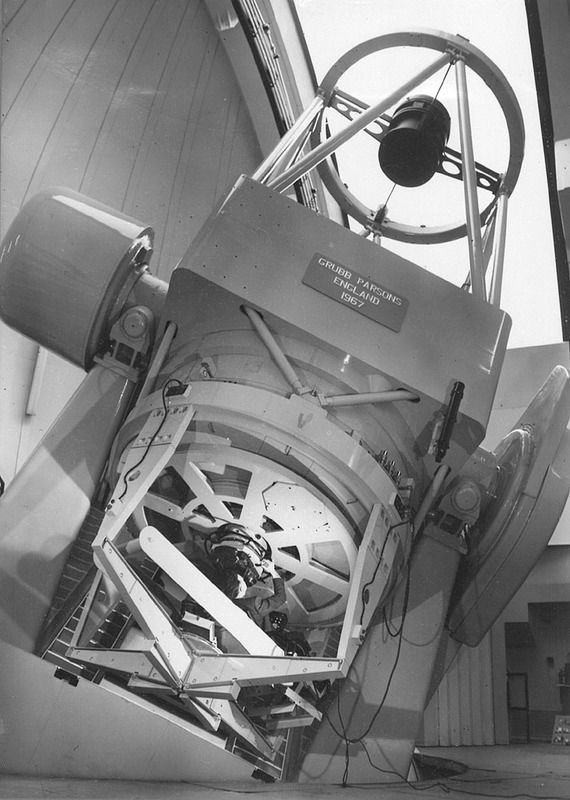 Lee T. Macdonald, 2012, "'A Large Chunk of Glass': The 98-inch mirror of the Isaac Newton Telescope, 1945-1959", The Antiquarian Astronomer (Journal of the Society for the History of Astronomy), 6, 4. Lee T. Macdonald, 2010, "The origins and construction of the Isaac Newton Telescope, Herstmonceux, 1944-1967", J. Br. Astron. Assoc., 120, 2. Article "Castle in the sky – the story of the Royal Greenwich Observatory at Herstmonceux" by Chas Parker. Book "The Isaac Newton Telescope at Herstmonceux and on La Palma", Anthony Wilson, ISBN 978-0-9512394-2-1. Currently, The Observatory Science Centre runs an extensive programme of activities in the former location of the INT Telescope in Herstmonceux.